Exactly one week ago, Jonathan and I had the wonderful experience of again photographing a wedding at one of our favorite venues, The Hewlett Barn and Stables. We were so blessed to spend the day with sweet Emily and Nathan and their families and friends! Every wedding week has its own little surprises and stresses, but I think Emily and Nathan had more than their fair share... In this case, Nathan had to battle the tummy bug the week before, and poor Emily had to make a trip to the ER just TWO DAYS before the wedding! But when their Big Day rolled around, it was full of so much love and laughter, all the stress and trouble just seemed to wash away. Look at all these beautiful smiling faces! Emily was surrounded by such a wonderful group of friends (plus one soon-to-be sister) on her wedding day. Just before Emily slipped into her wedding gown, I caught her sweet Momma helping her Dad practice for his First Dance with his baby girl. Emily waited to see her groom until the ceremony, but her Dad got to have a First Look moment of his own... and he was blown away! Good job, Mr. Holtman! And oh my goodness, do I have to say it? Emily was radiant on her wedding day. She kept her lovely composure even after a "near miss" with her groom - and let me tell you, I've never seen a bride move so fast to hide! 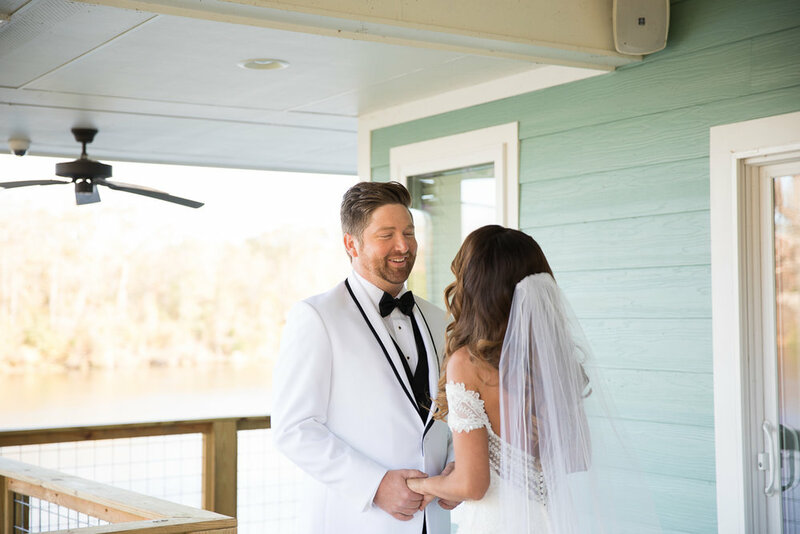 There's just something about that moment when the bride puts on her veil... Outside on the beautiful back porch, the handsome groom was all smiles, especially when his little nieces and nephew wanted a picture with him! 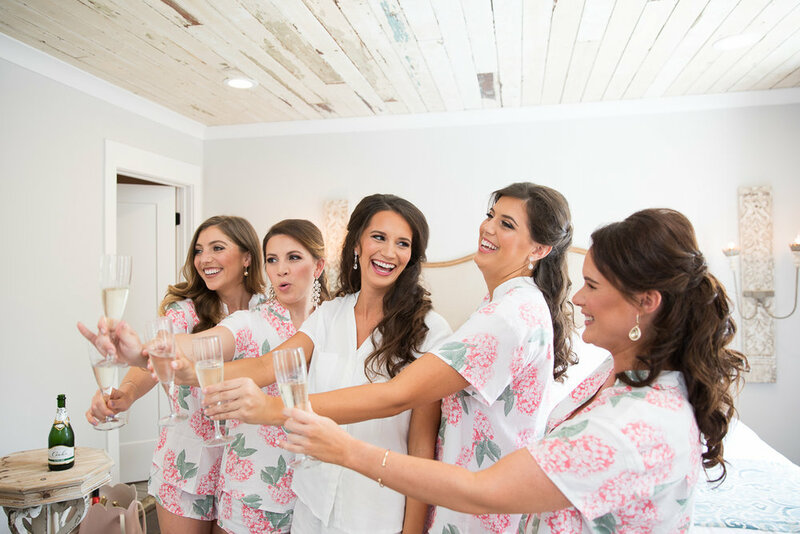 Emily's beautiful bridesmaids kept her smiling, and they were full of fun ideas for poses, which makes this photographer happy - I love it when the wedding party is committed to having a good time! They all looked SO so pretty in their bright dresses and cowgirl boots. .... And Nathan's groomsmen kept him from running! (Just kidding!) But these guys were a HOOT! And when I asked Nathan which one was his Best Man, he said that ALL of them were! I LOVE photographing friendships like this... And then it was almost time for the ceremony... Wait till you see Nathan's reaction when he saw Emily walking towards him on the arm of her daddy... I think for just a moment, time stopped for Nathan. And then his heart overflowed with joy, and some of it leaked out his eyes... And in the presence of many loving witnesses, these two sweethearts said "We do." And then the party began! (Y'all, I have a confession. I LOVE watermelon. It's my favorite fruit ever, and this beautiful fruit display had a MONOGRAMMED watermelon. Someone has MAJOR carving skills...) And Nathan's fishing-themed groom's table was so sweet & fun. His cake was perfect - it had so many charming details. I also loved the candy-filled fishing tackle box on the groom's table - what a fun way to celebrate the groom's favorite pastime! And the wedding cake was a simple yet elegant work of art (and since I am also a professional wedding cake taster, yes it was just as yummy as it was beautiful!) Just as the sun was getting low and the June breeze beginning to have the first kiss of evening cool, Emily and Nathan stepped away from the party for just a few moments... And then it was time to dance the night away! The beautiful evening ended with a fun bouquet and garter toss, and then the brand new Mr. and Mrs. Sprouse were sent away into the sweet Mississippi night under showers of bright blazing sparklers. Emily and Nathan, the two of us couldn't be happier for the two of you. It's made us very happy, and been such a privilege, for Jonathan and I to witness this part of your precious love story! Your wedding day was beautiful and joyful, and we know the future holds many more blessings and beautiful moments for you and your families. Amanda + Matt Said "I Do!" Oh my goodness. Today was Amanda and Matt's wedding day, and it was full of family, full of love, full of sweetness, and full of joy. This precious couple had their lovely ceremony and reception at historic Macon Presbyterian Church, the home church of the groom's family. As the bride and groom arrived, morning light poured through the intricately leaded windows - windows that Matt's grandfather created many years ago. I loved how the window panes became prisms and turned the light into shimmering rainbows. Amanda had roses, roses, roses everywhere. This CAKE, y'all. Every layer was a different flavor! It was GORGEOUS! Amanda gave a nod to her Norwegian family heritage by including a Soljie wedding crown at her cake table. Matt and Amanda chose to wait to see each other for the first time at the ceremony, and I LOVED Matt's expression when he saw his beautiful bride. I think he stopped breathing for a moment... Two sweet nephews had the honor (and joy) of ringing the bells to announced the new Mr. and Mrs. Matt McCann! We loved how Matt and his dad and brothers have a tradition of taking a ring picture at each wedding. Now every McCann man is taken! The reception decor was gorgeous. Did I mention there were roses EVERYWHERE? Amanda had an AWESOME surprise for her sweet pilot husband - she had made arrangements for a flyover of warbirds during the reception! They flew over the church not once, not twice, but three times! It gave me chills! At the end of the reception, Amanda and Matt made their departure under showers of sweet scented rose petals. But their day wasn't quite over yet - their next stop was the Macon Municipal Airport for some fun and unique bride and groom portraits! I have no words for how much Jon and I loved shooting these special photos for Amanda and Matt. A gorgeous, happy newlywed couple, a beautiful big sunny May sky, and PLANES. I mean, what a way to put a smile on a photographer's face! It was SO. MUCH. FUN. Amanda and Matt, you two blessed our socks off today. We enjoyed every moment of your beautiful wedding day (and every bite of that amazing cake!) Thank you so much for the opportunity to witness the beginning of your adventures as Mr. and Mrs. McCann! Many, many thanks to Mr. Keith Winchester, a close friend of the family who not only coordinated the wedding, but also created the gorgeous flower arrangements! Motherhood has been the greatest adventure, joy, and challenge of my life. Becoming a mom changed everything - my understanding of God, my understanding of myself, and my understanding of others. I know that one day our son will give his heart to a beautiful young woman and begin his own family, so when we photograph a wedding day, I am always deeply moved by the mommas. So in honor of Mothers' Day, here are a few of my favorite momma moments that we have been blessed to witness. This first image is dear to my heart... we photographed Bethany's wedding morning at her parents' home, and her precious momma had photos and mementoes of her children everywhere. So naturally her baby dress had to be photographed with her wedding dress. (P.S. 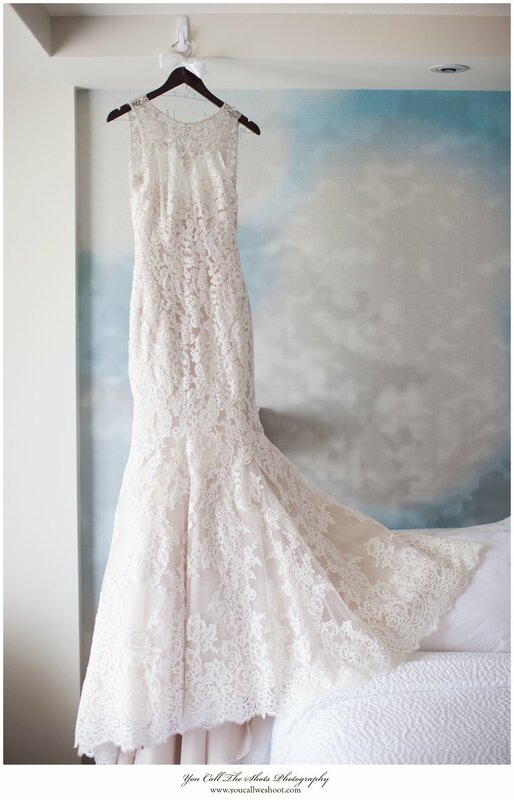 To see more of these beautiful wedding stories, just click on each photograph!) Laura Leigh's sweet momma (who I thought at first was one of the bridesmaids! I want to know her secret!) seemed so calm and happy as she helped her lovely daughter dress at The Magnolias. She and Laura Leigh share the same pretty smile! And here's a happy moment between lovely Heather and her momma on her summer wedding day at The Poor House in Starkville. I loved how precious Cate wanted lots and lots of photos with her proud momma on her wedding day in West Point. As Adam waited on the porch to see his beautiful bride Elizabeth for the first time, I caught his momma peeking at him through the window. (That's going to be me one day!) Their wedding at Shadowlawn Bed and Breakfast was full of precious momma moments. Elizabeth was so proud to be escorted down the aisle on the arm of her beautiful mom, Burnette (who also is the loving owner of the beautiful Columbus B&B!) I love it when I witness & catch glimpses like these - when everyone just loses themselves in the wonder of the moment. Mallory had just finished dressing and she and her mom had time to just look in the mirror and take it all in before the whirlwind began.... ... and this sweet hug on Leann's wedding morning says it all.... ...and so does this tender moment between Cody and his beautiful momma during his and his lovely bride Kathleen's reception at the Bryan Athletic Administration Building on the campus of MSU. And here's beautiful Kathleen and her lovely momma during her wedding morning at the First Baptist Church Chapel in Starkville. Tyler's a very strong guy, a proud Marine, and I loved loved LOVED how Jonathan caught him giving his momma this big hug during their dance. Mommas need lots of hugs, even after their baby boys grow up! (See yours truly in the background there? My second shooter does a great job, doesn't he?) Mommas also need to give their babies kisses, no matter how grown they are... But sometimes... sometimes mommas have to say goodbye before they want to, and even though I believe they watch from heaven, too often they can't be there to kiss their babies on the wedding day. I loved how R.J. kept his momma close to his heart on his and Mallory's wedding day at the Northpointe Red Barn in Jackson. So this is my official reminder to myself and all you grown up babies out there... Hold your momma's hand one more time. Let her hug and kiss you. Dance and sing with her... Because while a momma's love lasts forever, her hugs and kisses do not, and one day her voice will be a sweet memory until the circle is unbroken in heaven. And take lots and lots of pictures with her! Happy Mothers' Day to all the precious mommas, young and old! I have such a lovely wedding at Old Waverly to share with you today! Jon and I loved every moment of Chelsea and Chad's beautiful October day, so I've had a hard time curating these images - I want to show every single sweet moment! Let me just say, Chelsea's choice of a bold, refined and rich palette of deep reds and black, with touches of silver and sparkle, made her and Chad's wedding party elegant with a capital E. Especially since their chosen venue was the Clubhouse at Old Waverly Golf Club - a place that is very special to Chelsea's family, since her precious grandparents, Nudie and Edie Dowdle, are founding members. Can you believe this precious tiny tuxedo?? Wait till you see who wore it on his mommy and daddy's big day! Chelsea's smiles and laughter as her friends and family helped her dress absolutely lit up the room. Chad was nervous and excited and couldn't wait to see his bride. I think he began to get a little worried when Chelsea was a few minutes late to their First Look... I'm so glad the drizzle held off so these two sweethearts could have their First Look moment at this quiet pond under the branches of an old oak. Secret garden paths were made for sweethearts. After the bride and groom had their First Look, we all rejoined the wedding party. Here's that darling little guy in his precious tiny tux that I promised you earlier.... Look at this gorgeous, elegant wedding party! Especially the tiny ring bearer. I MEAN. He stole my heart (and I think everyone else's!) Look at these two! Don't they look like they belong on the cover of a magazine? I feel the same way about wedding cake... Chelsea had a special surprise for one of her little guests when she "tossed" her bouquet! Chelsea and Chad's family and friends sent them off with the sweetest sparkler exit. I loved how Mrs. Edie stayed far, far away from the fireworks, while Mr. Nudie enjoyed the sparklers! Chelsea and Chad, your wedding was as bright and elegant and lovely as the red roses that ornamented your day. It was such a blessing & honor to be witnesses to your joy! Justin & Trinidad Said "I Do!" 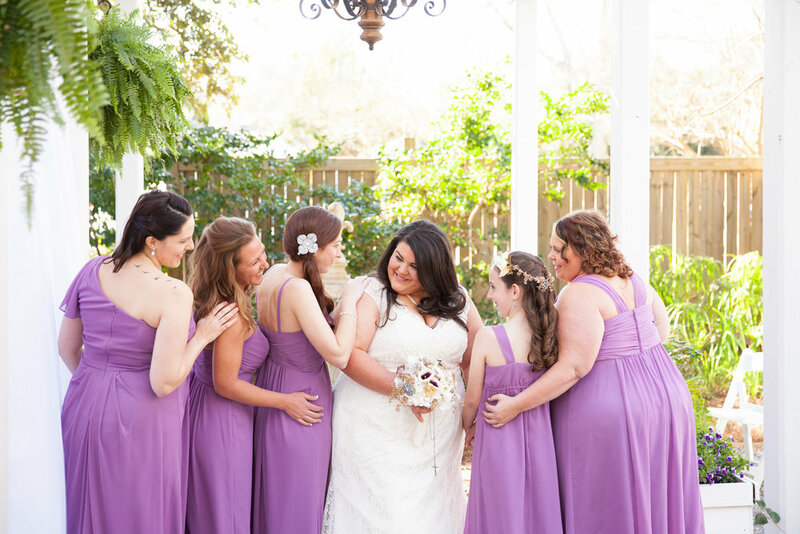 Here's a sweet sneak peek at a lovely little wedding in Ocean Springs! 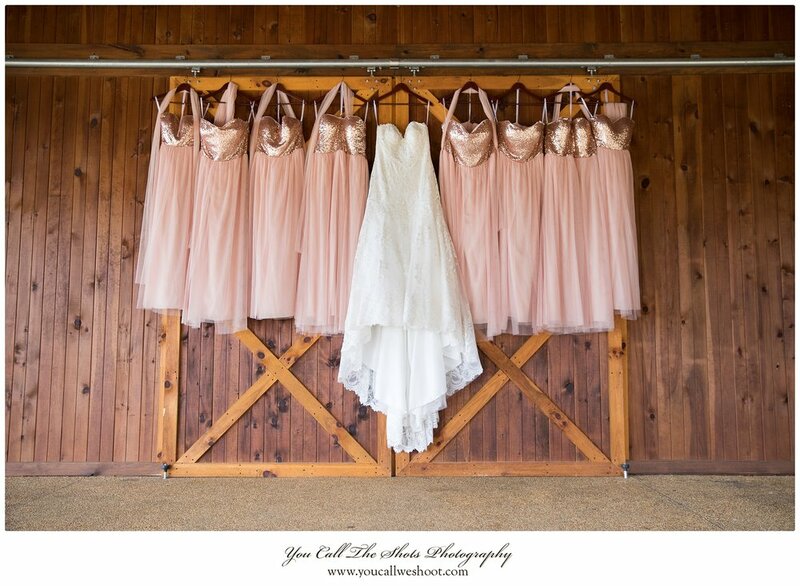 Take a little peek at the thoughtful & lovely details of Kimber's wedding morning at Old Waverly!